I have been away from Groves and Southeast Texas for 4 years this month and this is where my children Chase & Rhea were raised since they were 2 and 4 years old so this place is Home more so than anywhere else I have lived. I have wonderful friends there the best memories and it was a great place to raise my children. Yet after the struggles of two back to back divorces … It was within 16 months time frame … One marriage of 18 years and one of 11 months it left me humiliated and frozen and “no I did not want to build a snow man”. I built a kingdom of isolation and yes I was the Queen! The wind was howling, swirling and it was a storm inside. I couldn’t keep it in, Heaven knows I tried! So I have spent 42 of my 46 years saying Don’t let them in, Don’t let them see. Since I was saved in 1993 I began to try and break free from a traumatic childhood and I hide the pain because in Jesus name I was healed … Right that’s what Good Christian girls say! be the Good girl you always have to be, conceal, don’t feel, don’t let them know ! Well, now they all know the whole world knows! I turned away and slam the door. Let the storm rage on, the Cold never bothered me anyway! The wrong people payed for my lifetime of trauma after trauma that I just keep on keeping on with. It’s funny how some distance makes everything seem small and the fears that once controlled me can’t get to me at all. husband Mark have lived in a couple of years and she said at Christmas time I always think it needs some of your unique way of creating something in a junking kinda funky way. So for two months I have shopped in Goodwills, thrift stores and played around in my own little goodie stash to find treasures for my friend. I will be back to my “Let it Go”song in a bit. There have only been a few people in my entire life that I can fully connect with and I mean just know that no matter what I say or how I act they really really get me. Debbie is one of those people. She and I have been connected since our boys started Kindergarten. We connected on a deep level and during our friendship we walked together through many tragic things, trials, marriage issues, wayward children, church struggles, many road trips and she attended my brothers funeral with me and struggled through the trials of a girl who struggled within herself to be a mom she never had. So her asking me to do this after I distanced myself was a coming home for me. We join membership at Woodlands church. I begin to go to a local writers group the Woodlands, join a bible study with other women and respond in the group with things I know and little stories. I slowly connect with people outside Facebook… Oh the pictures and selfies. I fly to Colorado and go to the writers conf and connect with new friends and Donna Perry comes and stays the night. I mend a relationship with Randy and Alba my niece Presleigh’s parents.. I go to She Speaks and drag poor Lyndell with me from BridgeCity. I meet all kinds of cool people there that I admire like Jerry Jenkins, Lysa Terkhurst and oh like Christine Cain. Meet with Zondervan and Thomas Nelson. I slowly begin to rejoin the world this past year. For my birthday I buy tickets and Virginia Wilder and I go see & meet Chonda Pierce front and center !!! Then in August I sell thousands of dollars of Crafts and all of everything and let go of it all to then two weeks later, join an online group that simply was the kick I needed to bring me back out to being who I am!!!! Oh the writing and vision changed and I began to read my bible in a new way. I let go of people … I unfriended, blocked and decided that if they are not for me then I let them go. So it’s time to see what I can do… Test the limits and break through. wrong, No Rules for me I’m Free !!! Let it go … Let it go… You’ll never see me cry! Here I stand and here I’ll stay, let the storm rage on! Let it go and I’ll rise like the break of dawn let it go, let it go.. The perfect girl is gone! Here I stand in the light of day. Oh goodness in the 10 Months from 12-2010 until 08-2011 I was on my journey of Building the foundation of building Hope not Wasted and it was God, me & my Ford Escape, homeless and broken but God lead me to my husband and a new journey in my life and I can tell you God is not who the legalistic church folks say He is. He’s a Holy God but He will meet you right in the midst of your pain, struggle, shame,guilt, your past, your sin or whatever your in the middle of. He is not a mean God. Look at my last Name and look who I am married to and Look at how awesome our story is …. 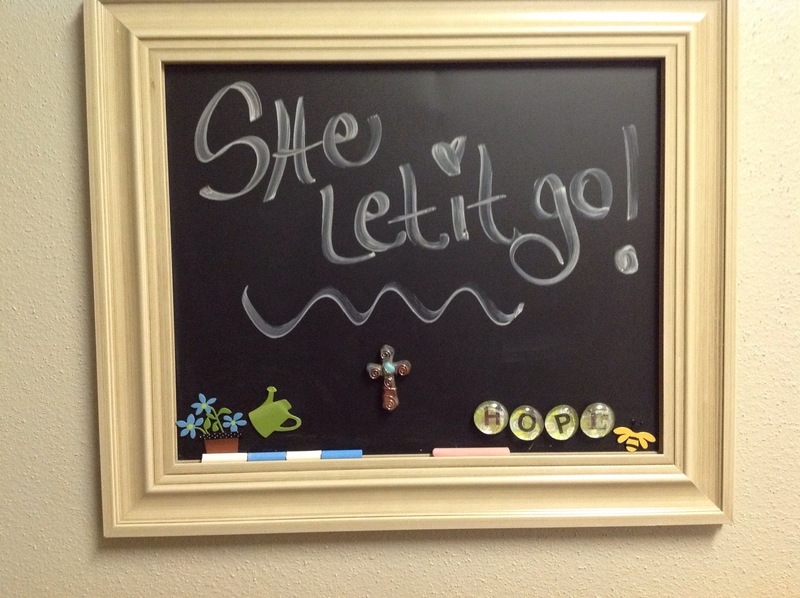 We let it go ….